Radiometric dating is not a reliable way to determine the age of a rock. Perhaps the best defense of radiometric dating we have ever seen is An Essay on Radiometric Dating by Jonathon Woolf. 1 It is worth examining because Woolf does a much better than average job of presenting the evolutionists’ arguments. If you want to know what evolutionists believe about radioactive dating, this is the essay to read. He begins his essay by saying that evolutionists haven’t done a very good job of explaining how radiometric dating works. We agree. We’ve been waiting for a simple and clear explanation like his because we don’t want to be accused of attacking a poor straw man. He begins with some definitions and explanations of terms. In particular, he clearly and correctly explains the differences between elements and isotopes (also called “nuclides”) of those elements. He does an excellent job explaining the fundamental concepts of nuclear physics. Then he goes on to explain how measuring the ratios of isotopes (which he prefers to call “nuclides”) can be used for radiometric dating. He is correct that we must know the original ratio of the isotopes, but he is wrong when he says there are cases when they think they know. In plain English, they are acknowledging that the number of protons, regardless of the number of neutrons, determines how atoms react chemically to form molecules—but the number of neutrons does make a very tiny difference in the amount of heat liberated by the reaction. So, for very light elements at temperatures close to absolute zero, chemical processes do actually differentiate very slightly between isotopes because of the barely measurable difference in heat involved in the reaction. But that’s just nit-picking about some special cases. We agree with Woolf that, in general, it is the number of protons that determines how chemical bonds will be formed. The number of neutrons is irrelevant. Furthermore, the ratio of isotopes in molten rocks does not change immediately when the rock hardens. The age of the rock formation is supposedly determined by how much the ratio of isotopes changes AFTER the rock hardens (which presumes that enough time has elapsed for radioactive decay to change that ratio). So, we still have the original problem. How does anyone know what the original ratio of isotopes was when the rock hardened? It depends on the method. He is absolutely correct. How do we know that? What he is saying (and what global warming believers generally ignore) is that the amount of carbon dioxide in the atmosphere has changed measurably (up and down) over the last 4,000 years of recorded history. The amount of carbon 14 in the atmosphere in the past has been calculated using the carbon dates of objects of known historical age (such as the coffin of a particular Egyptian pharaoh). So, because it can be calibrated using historical dating, carbon 14 dating is accurate. But carbon 14 dating is irrelevant to evolutionists because it can only be calibrated for the last 4,000 years or so, and because carbon 14’s half-life is so short that it is all gone after 50,000 years. Therefore, it can’t be used to measure the age of dinosaur bones that are millions of years old. Why does he think the ore “formed under the same conditions”? Clearly the conditions that formed rocks containing lead and uranium weren’t the same conditions that formed rocks containing lead only. If the conditions were the same, they would have formed the same mixture of lead and uranium in the rock. Identical processes produce identical results. If the results aren’t identical, the processes could not have been identical. He goes on to say that rocks can be dated by three different radioactive decay methods. But, what if the three dates don’t agree (as they often don’t)? The truth is that if the ratios agree, it is just a coincidence. Ratios of uranium decay byproducts in rocks tell you nothing about their age. Seriously? He thinks one can get “absolutely reliable measurements of the original quantity” of argon in potassium-argon dating? Potassium-argon dating is the method that has been known to provide unreliable measurements for the longest time! But let’s not get ahead of ourselves. He doesn’t do a very good job of explaining how the method is supposed to work, so we could not find a pithy quote in his essay. Basically, the idea behind this method is that when a volcano erupts, any argon (which is a gas) that was in the lava will escape before the lava hardens and traps the argon inside. Therefore, all the argon in the lava had to have come from the decay of potassium. Knowing how fast potassium decays into argon, one can tell how long it has been since the eruption. The “excess argon” problem has been known for decades. Potassium-argon dates of historically observed lava flows are off by millions of years because all the argon does not escape while the lava is still liquid. The “excess argon” problem has been documented in the peer-reviewed scientific literature for at least 46 years. Here is the abstract of the oldest article we could find on the subject. They know the potassium-argon dating of the Kilauea eruption is off by many millions of years because they know when it happened from historical records. For the potassium-argon method to work, ALL of the argon gas would have to be lost during and shortly after the eruption, so that all the argon gas trapped in the lava must have been generated by the decay of potassium after the lava cooled. But not all of the argon gas is lost. Some remains. How much? They took samples of lava from the Kilauea eruption and plotted the data. Depending upon where they took their samples, they measured amounts of argon gas equivalent to as little as 1 million years of decay up to as much as 43 million years of potassium decay (in lava that is only a few hundred years old). The graph shows 10-12 moles of argon per gram represents 1.5 million years of decay. How much is 10-12 moles? Unfortunately, they mixed measurement units when they expressed the ratio in moles per gram. So, we have to convert moles (the number of atoms) to grams (the mass of atoms) for the mixed ratio to make sense. One mole of argon 40 gas weighs 40 grams. 10-12 is scientific notation for 1/1000000000000 (that is, 1 divided by 1 followed by 12 zeros). So, 10-12 moles per gram is 40/1000000000000 grams per gram (40x10-12 grams/gram). That’s hard to visualize, so let’s think about an equivalent ratio of white and black sand in a cement truck. This cement truck holds 10 cubic yards of sand. That’s close to 10 cubic meters, which is 107 cubic centimeters, which is 2 million teaspoons. Pretend those 2 million teaspoons of white sand are radioactive and turn to black sand at the same rate as potassium decays to argon. After 1.5 million years there would be just 80 millionths of one teaspoon in the truck. Or, if you prefer to look at it another way, if you had 12,500 cement trucks (a convoy more than 35 miles long) full of our mythical radioactive white sand, after 1.5 million years the total amount of black sand in all those trucks combined would add up to one teaspoon. Just a tiny bit of argon gas trapped in lava will yield an apparent age that is millions of years too old. Let’s make three things clear. The “excess argon” in lava samples is not contamination. It did not work its way into the rock from some external source. It is not experimental error. It’s argon that really was in the lava from the time when the eruption occurred, and didn’t escape. The amount just exceeds how much they incorrectly think should be there. All the samples in Dalrymple’s & Moore’s report were taken from the same lava flow in a particular eruption. In other words, “the same process” created all these samples. Despite that, the amount of argon was different in every sample, ranging from the equivalent of 1 million to 43 million years of potassium decay. That’s not surprising. Granite is speckled because the minerals were not evenly mixed when the granite was created. Some parts of the rock have more dark minerals, and some parts have more light colored minerals. One should not expect argon (or potassium, or uranium, or lead, or any other mineral) to be perfectly homogenously distributed through rocks created by a single process at a specific time. The lava flow in question was known to be so young that there wasn’t time for a measurable amount of potassium to decay into argon. Therefore, all the argon measured was designated as “excess argon.” The report explained a number of creative ways to explain away the measured amounts. In college chemistry labs this technique is called, “fudging the data.” It isn’t really cheating, because the students know what their measurements should have been, so whatever correction factors have to be made to the data to get the right answer are legitimate. Evolutionists “know” how old the rocks must be, so they know how much “excess argon” can be discounted from their measurements to get the “right” answer. They fudge the data by subtracting an estimated amount of excess argon. If they don’t subtract enough, they get an age that is too old. If they subtract too much, they get an age that is too young. Potassium-argon dating is unreliable because it is based on wild guesses of how much of the argon came from decay of potassium, and how much was in the rock to begin with. Rubidium-strontium dating has basically the same problem as uranium-lead dating and potassium-argon dating. There are different amounts of the various strontium and rubidium isotopes in different parts of the rock. For what we (modestly) believe is a much better explanation of how isochron dating is supposed to work (and why it doesn’t really work), please see our Timeless Isochron essay. 18 An isochron plot, despite its name, does not tell anything about time. It merely shows that whatever process produces more rubidium-87 in a rock also produces more strontium-87 in that rock (and more potassium, too). Rubidium-strontium dating doesn’t always agree with other dating methods. Some of the world’s best scientists computed the age of the Apollo 11 moon rocks 116 times using methods other than rubidium-strontium isochron dating. Of those 116 dates, only 10 of them fall in the isochron range of 4.3 to 4.56 billion years, and 106 don’t. The non-isochron dates range from 40 million years to 8.2 billion years. 20 These rocks were carefully analyzed by top scientists making every effort to avoid contamination or other errors, and only 10% of the other methods agreed with the rubidium-strontium isochron dating—but rubidium-strontium isochron dating was assumed to be correct because it gave the “right” answer. 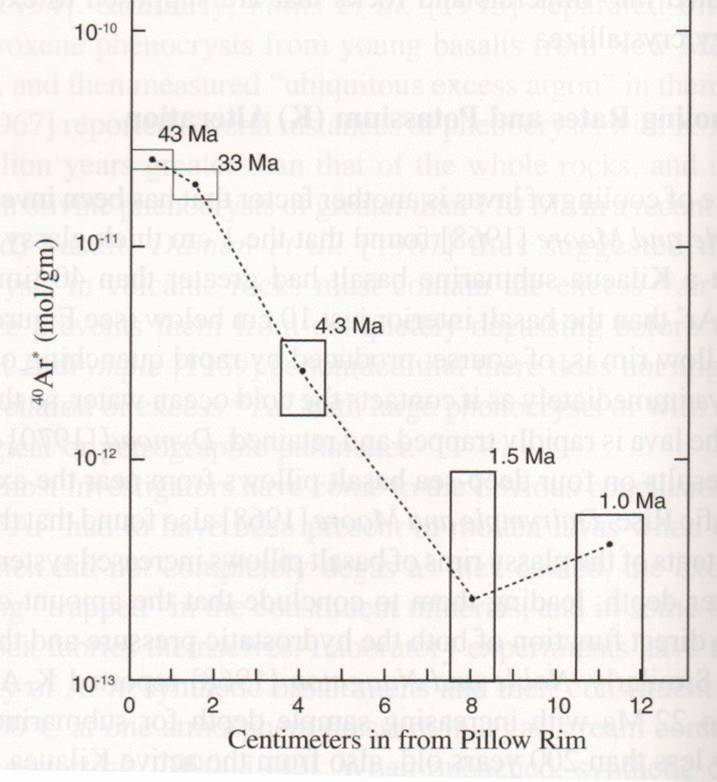 Radiometric dating methods are neither accurate nor consistent because (except for C14) ratios of isotopes have absolutely nothing to do with the age of the rock containing them. Carbon 14 dates are accurate (for the past 4,000 years) because legitimate correction factors have been determined by calculating the ratio of carbon isotopes in the atmosphere in the past. These ratios were computed by calibrating carbon 14 dates using known historical dates. Every other radiometric dating method depends upon knowing the initial ratio of isotopes. There is no way of knowing what the initial ratio was. The calculated age depends entirely upon the guess of what the initial ratio was. The guess is largely influenced by evolutionary bias.